A 15-year-old boy has been charged in connection with a hare coursing incident in Midlothian. The teenager was also charged in connection with a dishonesty offence that allegedly occurred at the same time on 31 March. He was further charged in connection with a separate hare coursing incident in the Pathhead area on 23 March. The boy is the second to be charged with the Dalkeith incident which took place on farmland. A report has been submitted to the Children's Reporter. Sgt Michele Lindsay, of Police Scotland, said: "We recognise the impact that hare coursing has on rural communities and remain committed to investigating all reports of this. "We are working with farmers to tackle this issue and patrols are being carried out as part of the rural crime initiative. 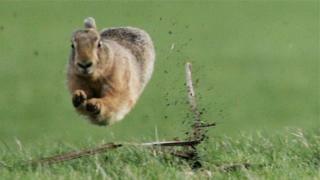 "Anyone with information about hare coursing or rural crime is urged to speak to a local officer.